Felix Pacheco three numbers. “Six-three-two.” That was all, but I was on high alert. My mind signaled the body, and I delivered a right upper cut, left hook, and right cross. Adventure Chick went boxing. Adventure Chick is a complete chicken when it comes to anything athletic, so this was a big step. To my utter amazement, I learned that athleticism doesn’t have to involve hand-eye coordination, which I ain’t got. And it doesn’t mean running faster than the other guy, which I can’t do. Here’s what I learned. When it’s just you versus a white-dotted pair of punch mitts covering the hands of a patient teacher, the mind can send signals, and the body will respond. So, picture a boxing gym in your mind, straight out of Rocky, and this is the place. Climb the exterior wood-plank stairs on a brick building tucked beside a car wash on Cameron Street. The theater geek in me kept thinking, “Up a steep and very narrow stairway.” Okay, it’s a lyric from A Chorus Line, but then again, the song is about finding refuge in a studio devoted to discipline. Actually very similar. At the top of the stairs, step through the door into a single room dominated by a boxing ring. On the wall are posters from boxing matches long past. A photo of Muhammad Ali smashing an opponent’s face. Flags of Cuba, Puerto Rico, Morocco – hung there, I was told later, by gym-goers encouraged to display their national pride. Punching bags and a speed ball hang near the back. Against the wall, a curious gizmo of red, yellow and green lights emitted a jarring buzz at odd intervals. It was still early on this Monday evening, but the place was humming. Young men socked away at the punching bag. Against the wall, a woman sat, wrapping her hands. Her name was Reneé. She was not young, in the way that I am not, either. She swims for fitness – bad knees, you know – but came here to box one day at the urging of her son. “I started sweating really bad, and I thought, I really like this!” she told me. Now, she comes every weeknight after work. Just show up, do some warmups and bag work, and get the six minutes of ring time allotted to every gym-goer. Good to hear. I had been worried. Reneé introduced me to the six moves of boxing, each number representing a different punch with left and right versions. 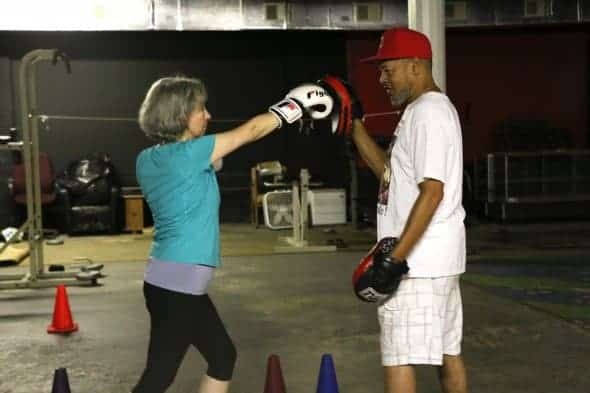 Before I got lessons of my own, I saw it in action when Reneé stepped into the ring with Pacheco, the gym’s co-manager and boxing coach. Her eyes never left Pacheco’s punch mitts as the two moved around the ring. In an even tone, he would say number sequences, and I began to understand. The numbers were directions. He’d say “one-five-three,” and she’d deliver the corresponding punches. Oh, boy. Here we go. We went into a cavernous, black-walled room, with nothing but a few pieces of exercise equipment, and some old chairs jammed against the wall. First, the stance. Every Adventure Chick lesson, I’ve noticed, begins with the feet. This time, it was left foot forward, knees slightly bent. Rock back and forth. Loosen the back knee, Pacheco said. Oh, that. My right knee was locked like a safe deposit box. I gave it some ease. Much better. Now, time to learn punches one and two. Another epiphany. I thought, “Give him the old one-two!” Where did I learn that saying? Who knows? I’ve probably seen it in a dozen movies. Now I know what it means. One is a left jab. Two is a right cross. “One-two,” Pacheco would say as he held up his mitted hands. My first stabs were pathetic. Then, an awakening. Maybe it was the realization that I couldn’t possibly hurt the wiry Pacheco, who has been boxing since 1977. Maybe it was the opportunity to punch every deadline, roofing bill, and annoying robocaller right in the gut. I punched. Hard. Well, hard for me. Somehow, the anticipation of aching knuckles didn’t deter me. I punched as hard and fast as I could. On to punches three and four, kind of sidewinders. Left hand punches with a torso pivot to the right. Right hand, vice versa. Five and six – what’s left but uppercuts, swinging the hands from hip level upward? “Shoot!” I yelled. It might have sounded more like another word, but it was noisy in there, so let’s say I adhered to the no-profanity rule. Forgiveness, even in boxing. I like it. That’s what Pacheco and this place are all about. He told me how he came to boxing. Seems he had some trouble as a youngster. Landed in jail for three years. Learned boxing to defend himself. “Before I left, I took my book out of the trash and took it home,” Pacheco said. A problem with his eyes took him out of the ring, but he realized he could teach young people the discipline. This gym is a labor of love for founder Ricky Clark, co-manager Darrell Martin, paperwork guy Lionel Dolphin, and Pacheco. The roof leaks, and if anyone out there has a space for lease, let them know (CamStBoxing on Facebook). In the meantime, this is a sanctuary for the young and the not-so-young. After my lesson came the moment of truth. Actually, six minutes of truth, timed by that gizmo with the green, yellow and red lights. Stepping into the ring is every bit as dramatic as you’d hope. Climb between the ropes, and take your corner. The floor had a cushiony spring. Pacheco lifted his mitted hands, said “one-two,” and we were off. Now I understood the intensity of concentration on Reneé’s face. Yes, there are only six punches, but you don’t know which combination comes next. Pacheco would turn, and I would follow, punching like the Adam West Batman. “One-one.” Pow-pow! “Two-three-two.” Bam-zang-bam! Sometimes – okay, often – a combo like “one-five” would throw me. The body wants to go left-right. Except that “one-five” is left-left. And then came the real test. Wait. What? Here we go. I delivered in sequence, tentatively. Again, Pacheco said. And again. Now I was chanting with him. “One-five-six-three-two. One-five-six-three-two.” Then he stopped saying the numbers. Muscle memory kicked in. I was punching in rhythm, intensifying with each round. I hadn’t felt this good since – well, ever. Jarring beeps from the red light-green light gizmo, and my six minutes were over. I survived my time in the ring. I hadn’t embarrassed myself, and even if I had, nobody cared. The gym was abuzz. Men punched bags. Kids jumped rope. Young parents had their adorable little ones in tow. I got to talking with one young mom who didn’t box anymore. She seemed genuinely shocked when I told her it had been my first time in the ring. Very gratifying. When I got home, my husband greeted me with the Rocky fanfare. I raised my arms and did a little jig, like I had topped the Philadelphia Museum of Art steps. But I had hardly come as far as Felix Pacheco.